Description: Promotional flyer handed out at certain video game retailers advertising the game. Nothing Hurts More Than The Truth. 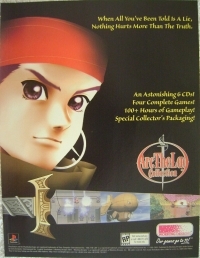 This is a list of VGCollect users who have Arc The Lad Collection Promotional Flyer in their Collection. This is a list of VGCollect users who have Arc The Lad Collection Promotional Flyer in their Sell List. This is a list of VGCollect users who have Arc The Lad Collection Promotional Flyer in their Wish List.